SCHMIDT, Mike (1949- ) Considered one of the greatest 3rd baseman of all time. Inducted into the Hall of Fame (1995). 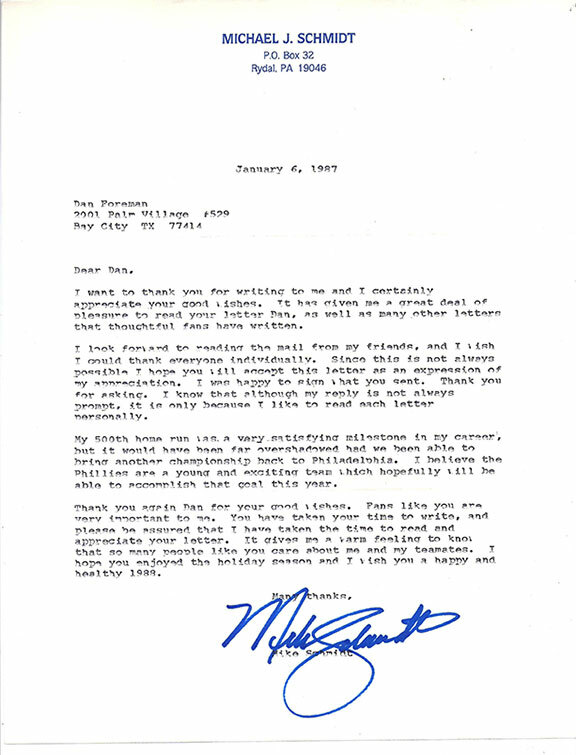 Typed letter signed, one page, January 6, 1987 on his name imprinted letterhead. To Dan Foreman Schmidt writes in part: “….it has given me a great deal of pleasure to read your letter…I look forward to reading the mail from my friends, and I wish I could thank everyone individually. Since this is not always possible I hope you will accept this letter as an expression of my appreciation. I was happy to sign what you sent. Thank you for asking. I know that although my reply is not always prompt, it is only because I like to read each letter personally.